LOS ANGELES, Feb. 16, 2017 /PRNewswire/ – Rock legends REO SPEEDWAGON and STYX, along with very special guest star DON FELDER—formerly of the Eagles—will join forces for the “United We Rock” U.S. summer tour, which kicks off in Ridgefield, WA on June 20. Produced by Live Nation, tickets for various cities will go on sale starting February 24. For more information please visit livenation.com. Styx, REO Speedwagon and Don Felder will be offering direct-to-fan access to the best seats in the house via their own exclusive pre-sales beginning Tuesday, February 21 at 12pm local time, through Thursday, February 23 at 10pm local time. Visit StyxWorld.com to join the Styx Lounge for access to exclusive content, ticket pre-sales and VIP packages, visit REOSpeedwagon.com for information about REO Speedwagon’s VIP packages and ticket pre-sales, and visit DonFelder.com for information about Don Felder’s VIP packages and ticket pre-sales. General onsale begins on Friday, February 24 at 10am local time. For more information on tickets please visit livenation.com. STYX – Tommy Shaw (vocals, guitars), James “JY” Young (vocals, guitars), Lawrence Gowan (vocals, keyboards), Todd Sucherman (drums) and Ricky Phillips (bass), along with the occasional surprise appearance by original bassist Chuck Panozzo—would eventually transform into the virtual arena rock prototype by the late ’70s and early ’80s, due to a fondness for big rockers and soaring power ballads. Over the course of their 40-year career they’ve released 15 studio albums, six best-of compilations and four live albums, garnering eight Top Ten singles. 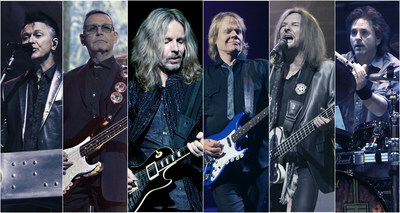 STYX has sold over 30 million albums worldwide. Throughout their illustrious career, they’ve performed more live shows since 1999 than all of the previous years of its career combined. Two Super-Bowl appearances, Pollstar box office chart-topping tours with Def Leppard, Journey, Boston, and Bad Company (to name only a few), two more studio albums. September 2, 2016 marked the long-awaited release date of STYX: LIVE AT THE ORLEANS ARENA LAS VEGAS on DVD, Blu-ray and Digital Formats via Eagle Rock Entertainment. It captures the band performing in July 2014 such fan favorites as: “Too Much Time On My Hands.” “Fooling Yourself (The Angry Young Man),” “Renegade,” and more. It also includes a special surprise visit from DON FELDER for a rousing performance of “Blue Collar Man (Long Nights).” It was released on CD July 24, 2015. STYX continues to conquer the planet, one venue at a time. DON FELDER – former guitarist of the Eagles, New York Times best-selling author and four-time Grammy® Award winner—released his second solo album (and first since 1983), ROAD TO FOREVER, on October 9, 2012 and has been on tour throughout the U.S. ever since. To coincide with the launch of “The Soundtrack of Summer,” the album was re-released with four additional songs, ROAD TO FOREVER: EXTENDED EDITION, via INGrooves Music Group. FELDER’s ROAD TO FOREVER originally debuted on Billboard‘s “Heatseekers” chart at #27. “Girls In Black,” the album’s first single, reached the Top 30 on the Mediabase Rock chart while the second single, “Wash Away,” co-written by FELDER and Styx’s Tommy Shaw and featuring Shaw’s signature vocal sound, quickly jumped to #4 on the Mediabase Classic Rock chart. FELDER wrote or co-wrote all the songs and performs guitar and lead vocals on the album, which boasts a long list of iconic guest performers including: David Crosby, Graham Nash, Stephen Stills, Steve Lukather, David Paich and Steve Porcaro of Toto, Randy Jackson, Styx’s Tommy Shaw and others. It was produced by FELDER along with Robin DiMaggio (Posse 2.0 bandleader on the “Arsenio Hall Show,” United Nations’ Musical Director).